Have you ever walked Stanley Park’s seawall, its trails or beaches and wondered who wandered there before you? What was the Park like 100 years ago? 1000 years ago? Acclaimed author-historian Jean Barman will share how “forgotten families” – from First Nations to Europeans, Hawaiians and Chinese – lived in Vancouver’s famous park. Our enthusiastic staff will also be on hand to talk about SPES’ Conservation and Stewardship programs, Public Education and Outreach events, and School Programs. 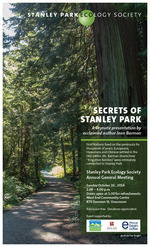 Learn how SPES maintains and restores Stanley Park’s fragile habitats, supports wildlife, and provides environmental education to thousands of students and the community. We hope to see you on October 26!